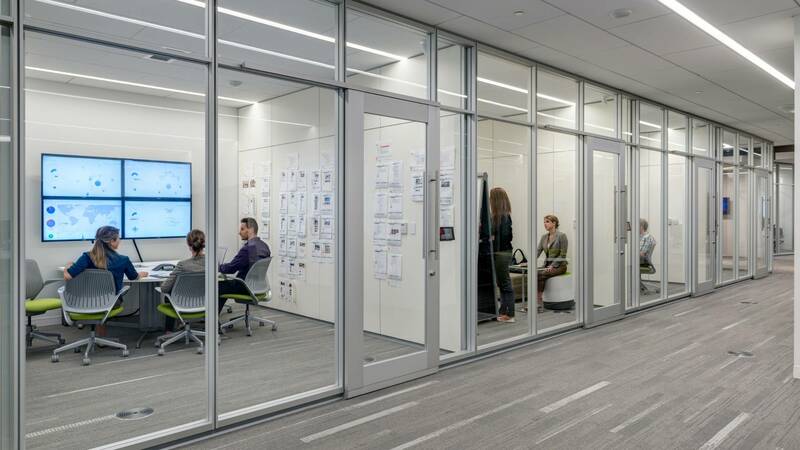 Steelcase take some time out to run through an impressive culture-led office transformation for its client, La-Z-Boy. Cubicles and walls stifled communication and collaboration. Employees assigned to fixed desks and technology couldn’t easily share information and ideas. Piecemeal office renovations over the years did little to support changing work processes or bolster organizational culture. Potential recruits, existing customers and dealers all disliked coming to La-Z-Boy’s headquarters. “We were working in the dark ages,” says Kurt Darrow, chairman, president and CEO. La-Z-Boy leadership, however, decided to up the stakes. “A new workplace offers an opportunity to change the culture, to do things differently as an organization. That became a strategy for us, to use this new space to create change throughout our company,” says Darrow. Leadership addressed a growing concern in many companies around the world. Studies show that organizational culture and employee engagement are among the most pressing issues for corporate leaders. In fact, 87 percent of organizations cite them as one of their top challenges. The work environment has a major impact on those issues, but is often overlooked by many organizations. 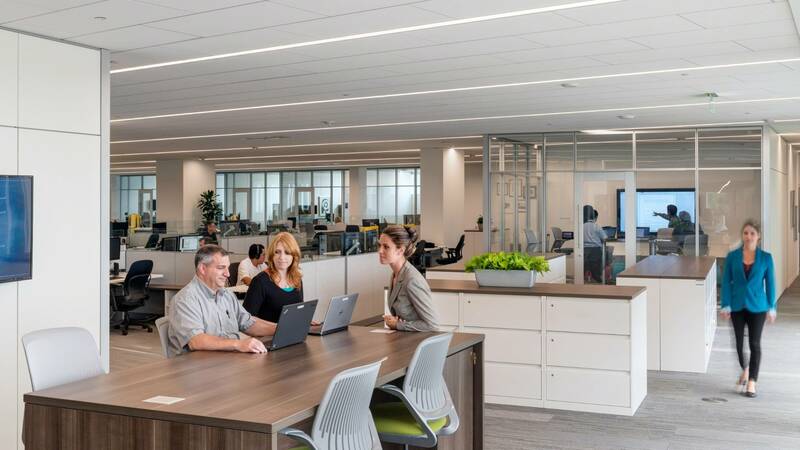 La-Z-Boy would use their new corporate headquarters building, and an extensive culture change management program developed with Steelcase Applied Research & Consulting, to help transform the organization’s culture and re-energize employees. But first, it needed to clearly define where the company was headed. La-Z-Boy’s objectives were derived from the company’s Critical Success Factors — the few, crucial things a company must do well to achieve their goals over the next three to five years. These factors helped define the organizational culture the company desired, and in turn informed the work environment. For example, helping employees be more empowered and accountable led to providing them with laptops and an ecosystem of workspaces, so employees (with no assigned workspaces) can choose each day where and how they need to work. The change would require more than laptops and fast Wi-Fi. Training for both management and staff were needed, and, more importantly, a major effort to engage with employees to drive change in company culture. To help plan and implement the changes, the ARC team assessed existing work processes and workspaces, and led workshops with staff and management to gather input and ideas to inform the design of the new workplace. They also developed tools to help management promote culture change. Employee involvement was key. “ARC interviewed all of our people here at the home office. They asked them what they needed in the new office, how they worked, and observed how they went about their business,” says Darrow. “From the focus groups, to the pilot, to move in, employees were engaged throughout the process,” says Sue Vanisacker, director of community relations and talent acquisition. Leader workshops developed the critical success factors and assessed the organization’s readiness for change. Staff workshops considered how the critical success factors could be best supported by the work environment. All workshop groups built three-dimensional models to demonstrate desired workplace concepts. The results from the workshops informed the design of the work environment, and took the change management program to a critical stage: the workplace piloting program. A major investment, its success would depend on getting employees to use the pilot space and provide thoughtful feedback. 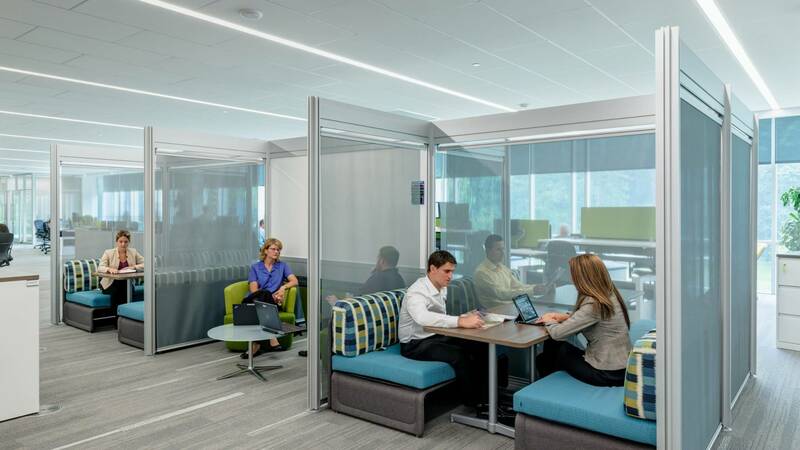 La-Z-Boy used their new corporate headquarters building, and an extensive culture change management program developed with Steelcase Applied Research & Consulting, to help transform the organization’s culture and re-energize employees. At 10,000 square feet, with space for 125 people to work for 90 days, the piloting program required a substantial investment. Throughout the headquarters project, internal communication was constant: in-person meetings, emails, videos (one favorite: a weekly video of the building construction, shot with a drone developed by the IT group), and four visits for all employees to the new site at different stage of development. Change management efforts continued after the move, often in tandem with other corporate efforts. For example, a building scavenger hunt encouraged employees to visit the various workspaces in the building, an activity that dovetailed with the company’s wellness efforts. “You couldn’t sit in the old office and tell employees things were changing. This new space is a very visible, tangible icon of change. It sends a signal: things are changing, and no one’s surprised that we’re changing as a company,” says Eric Hulseman, project manager. Employees at other La-Z-Boy locations were also involved in the culture change effort. All employees were surveyed and are providing input on changes to their own work environments. “We’re replicating the process at our plants, our showrooms, and our R&D center,” says Vanisacker. La-Z-Boy’s new headquarters is the physical expression and a key driver of the company’s internal transformation. It supports and encourages a more open and transparent organization, with greater communication and more frequent collaboration —a key objective for the transformed organization. He credits Steelcase Applied Research & Consulting as important partners in the project. “You know, we’ve built factories, and we’ve built stores, but we’ve never done anything like this. previousIs Money Alone Enough to Win the War on Talent?